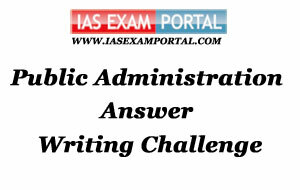 Weekly Mains Exam 2016 Answer Writing Challenge - Public Administration "MODULE- 46" | IAS EXAM PORTAL - India's Largest Community for UPSC Exam Aspirants. Weekly Mains Exam 2016 Answer Writing Challenge - Public Administration "MODULE- 46"
Public Administration- Paper I "Syllabus Topic – Public Policy : Models of policy-making and their critique"
Q1. Mixed scanning helps in combining the merits of Rational and Incremental decision making. Comment. Indian Administration- Paper II "Syllabus Topic – Union Government and Administration: Parliament"
Q2. "Discuss the performance of Indian Parliament after independence. What are the Parliamentary privileges given to Members of Parliament in India?" The performance of the Parliament from being an ideal platform to express dissent and adequate participation of both the Government and opposition during Nehru’s times has slowly degenerated over a period of time. The initial parliamentarians were all scholars and experts in their domains and hence brought qualitative discussions to the table. Over time, the Members of Parliament are predominantly Generalists who lack technical knowledge needed in the domain of policy making and hence mostly stay quiet. During Indira Gandhi’s time, the Indian Parliament reach a plummet, where to confront an uneasy opposition an emergency was declared, many opposition members were arrested and basic fundamental rights were curtailed. In the years following there has always been stiff resentment by the opposition that reduces the pace of functioning of the parliament. Thereafter Parliament has turned into a battlefield with the tradition of non-cooperation with opposition and Parliamentary standards have declined drastically over the past couple of decades. Art 105 of the Indian Constitution provides for power and privileges of the Houses of Parliament. Constitution grants these privileges with a view to maintaining the independence of action and dignity of the position of the House of Parliament, their Committee and members and to enable them to function without any hindrance. 1. Freedom of speech in Parliament which is most imp of all the privileges. It is absolute in nature unlike freedom guaranteed under Art 19 1(a) which is subjected to reasonable restriction. Such privilege is granted so that members may express their views upon any policy subject without any fear or inhibitions. 2. No member shall be liable to any proceeding in any court w.r.t anything said or done inside the Parliament and no person shall be so liable in respect of any publication under authority of the House of the Parliament. 3. The Parliament may define privileges for the members time to time by suitable legislation.